New Year’s Day! It is time for me to start thinking! And to help me break out of the lethargy of both the long holiday season and my avoidance of writing any new web log messages, I am resolved to start anew by launching into a series, which may tax my memory a bit, but still provide me with sufficient material to get me through the rest of the winter. I am in the process of cleaning out my office files and have been delighted to re-discover some of the ephemera I have hoarded over the years, thinking that my projects had value. Today they do as they will prove to be the source of my inspiration to write about deeds done and the results of my labors. It will also allow me to enhance this website’s archives page as each of the projects I write about will be listed there in recognition that a manager can do more than pay bills and files financial reports no one will ever read. 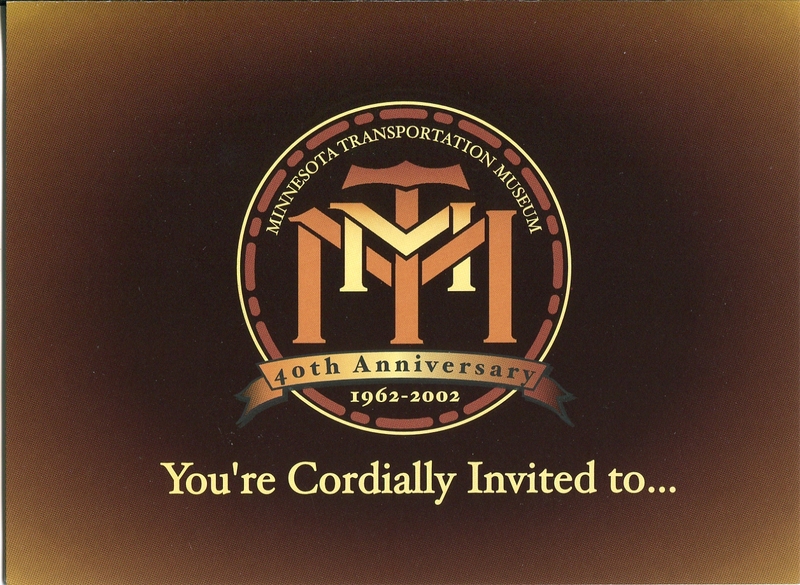 So you are cordially invited to join me, appropriately enough, with this first message in the series describing the creation of an invitation to the 2002 members’ meeting for the Minnesota Transportation Museum. 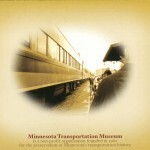 At the time MTM was an amalgamation of disparate transportation sites recreating historic travel aboard streetcars, a steam boat, buses, and trains. 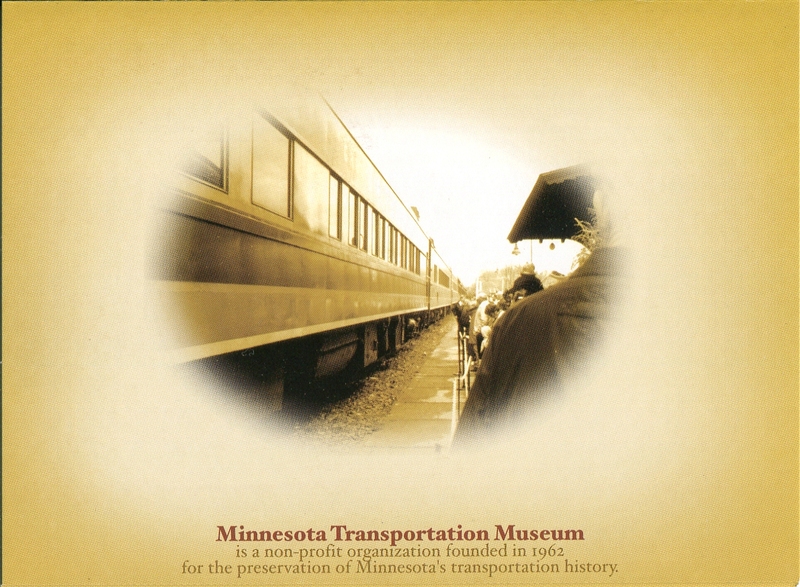 I had been MTM’s executive director for a little more than a year and was trying desperately to create a unified organization covering five sites spread out over a hundred mile stretch from Lake Minnetonka in the west to Osceola, WI in the east. MTM was divided into operating divisions with the derivative word divisive being an apt term to apply to how they functioned, or failed to do so, as a supposedly single entity. Except for the accounting system, everything else was decentralized to the point of being grossly inefficient and ineffective, especially when it came to marketing and fund raising, things that I was hired to improve. One of my first projects to help overcome the problem was to create a single promotional brochure, which will be described in a future message in this series. Another was an attempt to restructure the annual members’ meeting; a poorly attended, unimaginative affair that will be forever associated in my mind with my predecessors serving wine in a box as an attempt at class. I am a strong proponent of finding something new to offer any audience. And for the members of MTM the something new involved three things – location, program and the all-important food service. Location was the easiest of the three criteria to fulfill. The former Milwaukee Road depot in downtown Minneapolis had recently been renovated as part of a hotel/conference center. It fit my heart’s desire to find a place that had cultural significance along with a transportation affiliation. The Courtyard at the Depot was a perfect fit for this and for its tie-in with the program. 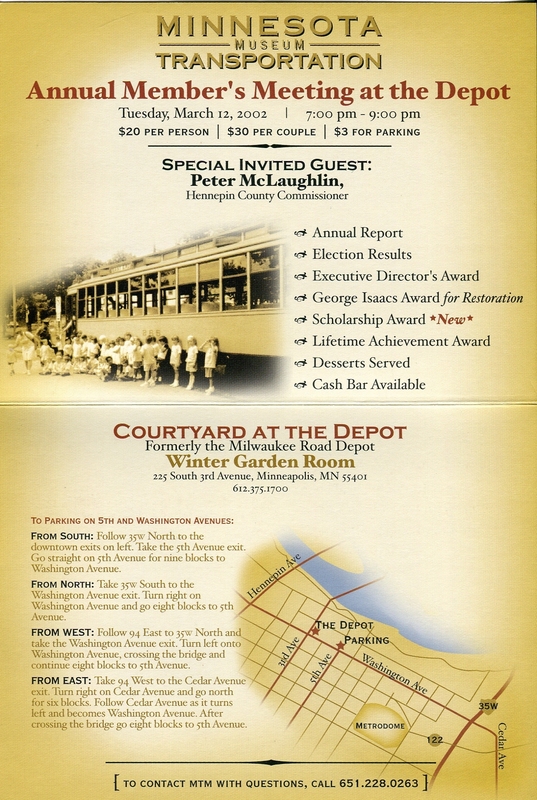 You can see on the invitation that our special guest speaker was Hennepin County commissioner Peter McLaughlin. And that night he unveiled the initial plans for MTM to participate in the development of a new museum in cooperation with the county to repurpose the former monolithic Sears Building on the city’s south side into a transportation hub – another future web log message. The program also contained other elements I think are important for a volunteer-driven, non-profit corporation; accountability in the form if a (brief) financial report and the bestowal of awards celebrating the work of the member/volunteers in order to boost morale, celebrate examples of what we want from our volunteers and to encourage further participation by knowing that you may someday be publicly acknowledged for your efforts. 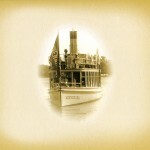 I wanted the food service to be just as special as the choice of location and the surprise elements of the program with its awards and the announcement of a new initiative. To do this and to keep the cost manageable we held the meeting after the dinner hour, allowing us to offer specialty desserts as opposed to a full meal. And since MTM was too poor to cover any of the costs from its general fund you can see that there was a price for admission and we replaced the ubiquitous wine in a box with a cash bar. 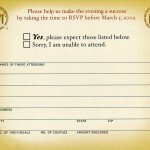 Requiring members to pay to attend had one other benefit that I will admit to all these years later. It prevented a certain element within the membership from attending, comprised of those folks who thought their meager membership dues entitled them to enjoy everything museum related for free. But not that night. The quality of the event was matched by the quality of those who attended, whether they be members, staff or invited guests. The camaraderie reached across divisional lines and for a brief moment I thought I was looking at a new era in the history of the organization. But that was not to be, which is another story for me to tell another time. 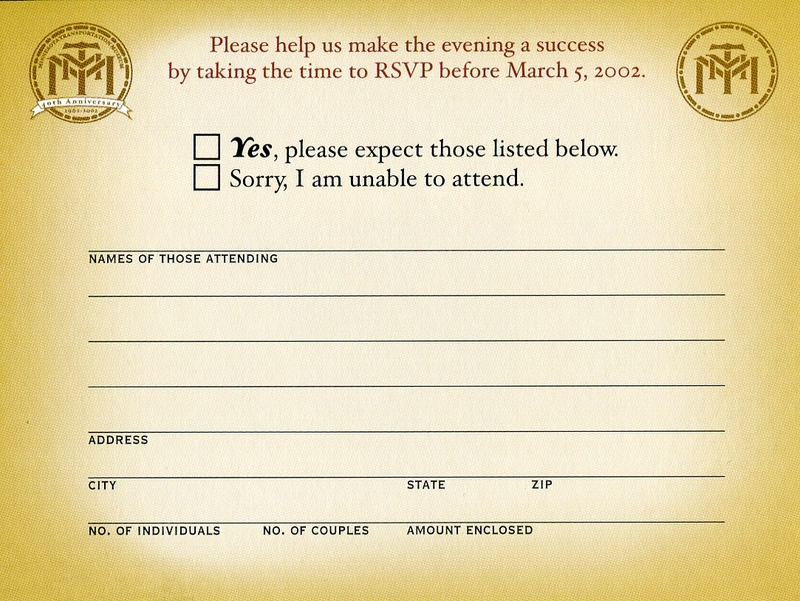 Turning my attention back to the invitation, here are a few more tidbits that went into its design in order to create an attractive piece and avoid some of the major pitfalls inherent in a dysfunctional organization. There was a lot of pertinent information to convey in a small space, which we achieved without losing a pleasing presentation to attract the eye to the extensive content. 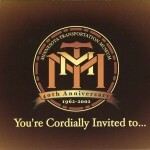 The colors chosen were representative of the colors found on the historic equipment that served as icons of the MTM operation, but toned down in such a fashion as to express warmth intended to enhance the concept of this being an invitation worth responding to. 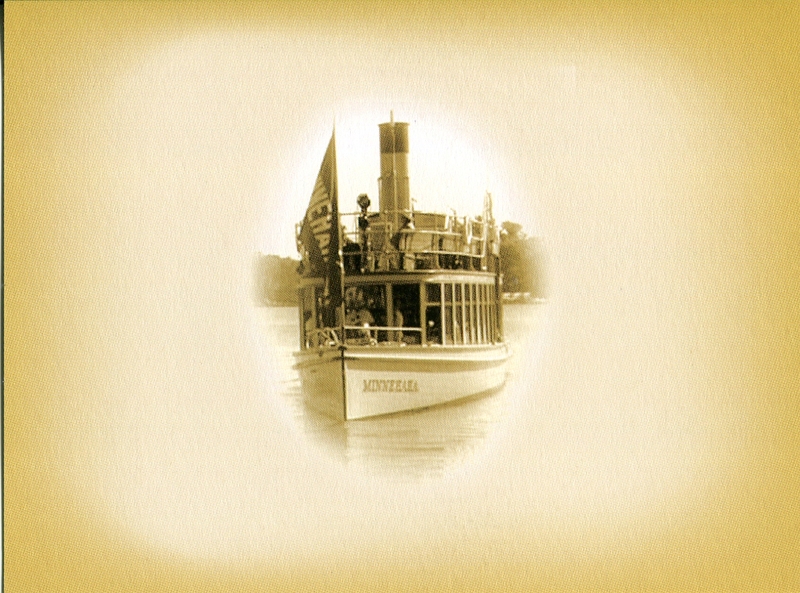 You will also see that on the upper inside panel of the invitation we used the image of a streetcar at the Como-Harriet station, on the back panel we used a scene from the train ride at Osceola, and on the back panel of the response card we pictured the steamboat Minnehaha cruising the waters of Lake Minnetonka. It was extremely important that we feature all three of these pre-eminent operating divisions within MTM so that no one appeared to be favored over another. That is one of the challenges of trying to bring unity out of disparity. Equitability must appear to be effortless, but I never found this unappreciated, highly valuable aspect of management to be so. It comes with its own price and no cash bar. This entry was posted in Uncategorized on January 1, 2016 by Don Meyer.